If traditional antiperspirants and deodorants cause you discomfort, you might consider using powder for deodorant after you shave. You may opt for a basic talcum powder, or something a bit more specialized. Read on to learn more about the offerings and what their benefits are. Though many deodorants are formulated with the needs of sensitive skin in mind - just look at all the selections touted as "gentle" and "soothing" on even the most easily irritated skin - and you might have a hard time believing that some people can't find any deodorants that work for them. It's true, though - and you may not even have sensitive skin to begin with. An allergy to a particular ingredient or intolerance for a specific fragrance is all it takes. Some people develop bumps or severely irritated skin in the wake of using deodorant. For these individuals, it can be quite frustrating finding a solution. A few natural deodorants might be worth a test shot, if only to determine whether or not they are tolerable at all (note that many of them make ample use of ingredients like essential oils, which might cause irritation on some types of skin; others are fragrance-free). Then there is the famous "crystal" deodorant - this is essentially a stone-like bar made with natural mineral salts. Its job is to prevent odor (note that it is not an antiperspirant and thus does not reduce sweat). Some people find relief with this, while others state that it doesn't provide them with the maximum protection they would receive from a traditional deodorant. 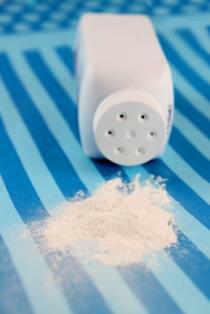 It's no surprise, then, that many individuals turn to powder as a complete alternative to deodorant. Since talcum powder itself keeps wet skin dry, leaves it pleasantly scented and relieves the discomforts of diaper rash, it almost seems a no-brainer that it would work as both a deodorant and an antiperspirant. Original Medicated: This is the one that started it all. It heals the skin and keeps it cool and fresh. Shower Fresh: If you prefer a little fragrance, consider Shower Fresh, a light, botanical aroma. Consider skipping it, though, if you are sensitive to fragrance in general; it may not play well on freshly shaved skin. Active Sport: Infused with menthol, this extremely deodorizing powder is a great choice for anyone who spends plenty of time outdoors. It keeps the skin cool and leaves behind a light, fresh scent. Founded in 1810, the Clubman line of talcs is just a small part of a classic collection of men's grooming products. They've been relied on for decades, and with good reason. Choose from a selection of white or flesh tone talcs; they all help prevent excess moisture and keep skin dry and itch-free. Coconut Deodorant Powder: Made with coconut milk, creamed coconut and coconut oil, this soothing powder is infused with a blend of calming, tropically scented essential oils. Its powders include cornstarch, tapioca and natural mineral magnesium carbonate. The Greench Deodorant Powder is made with sage, rosemary and tea tree powders, which are then blended with tea tree and thyme oils for a naturally "green" product. This is a favorite among those with especially sensitive skin.